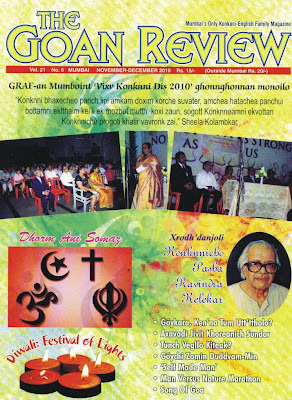 The Diwali special (November-December) issue of Mumbai’s Only Konkani-English bi-monthly The Goan Review edited by Fausto V. da Costa has hit the news stands. The main features in this issue are: Diwali: Festival of Light and the celebration of World Konkani Day in Mumbai. 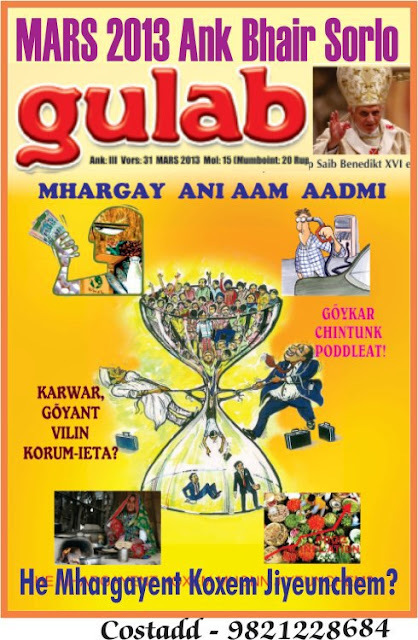 Besides these main features thought-provoking articles by the stalwarts – John Aguiar’s ‘Dhorm Ani Somaz’ Felix P da Cruz’s ‘Gõychi Zomin Bilddorank Duddvam-Min’ Willy Goes’ ‘Self Made Man’ Gualdalupe Dias’ ‘Axavadi Jivit Khoreanich Sundor’ Eusebio Gomes’ ‘Budhvont Porikxa’ , Vincy Quadros’ ‘Novo Vichear’ and the editorial ‘Gõykara, Ken’na Utt’ttholo?’ in the Konkani section and ‘Man verus nature Marathon. (Domnick Rodrigues), ‘Song of Goa’ (Dr. Jose Pereira), ‘History of Konkani Literature’ (F.C. ), Goa News Round Up etc. in the Englsih Section. The issue priced at Rs. 15/- per copy is available at the regular outlets in Mumbai and Goa. For details and annual subscription you may contact the publisher on 9821228684. Mumboichem ekuch segit 23 vorsam ekui khondd nastana uzvaddak yevpi Konknni-Inglix du-masik The Goan Review hacho Divallecho ank bhair sorlo. Hea ankant Divalli ani Mummboint Konknni dis somorombhnni hea vixoyancher xins kotha asat. 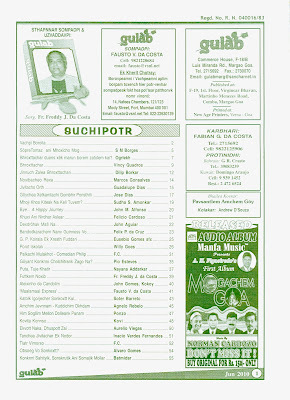 Xivai ‘Dhorm Ani Somaz’ (John Aguiar), ‘Gõychi Zomin Bilddorank Duddvam-Min’ (Felix P da Cruz), ‘Self Made Man’ (Willy Goes), ‘Axavadi Jivit Khoreanich Sundor’ (Guadalupe Dias), ‘Budhvont Porikxa’ (Eusebio Gomes), ‘Novo Vichear’ (Vincy Quadros) ani ogrlekh ‘Gõykara, Ken’na Utt’ttholo?’ adi. heo kotha Konkani vibhagant, zalear ‘Man verus nature Marathon. (Domnick Rodrigues), ‘Song of Goa’ (Dr. Jose Pereira), ‘Who Am I?’ (Lee Ann Fernandes), ‘History of Konkani Literature’ (F.C. ), Goa News Round Up etc. Inglix vibhagant aspavtat. Ho ank 15 rupiank sogleam svatancher vikrek asa. Odhik mahiti khatir ani vorgonni khatir sompork sadoum ieta uvzaddavpea lagim hea ankddear: 9821228684. 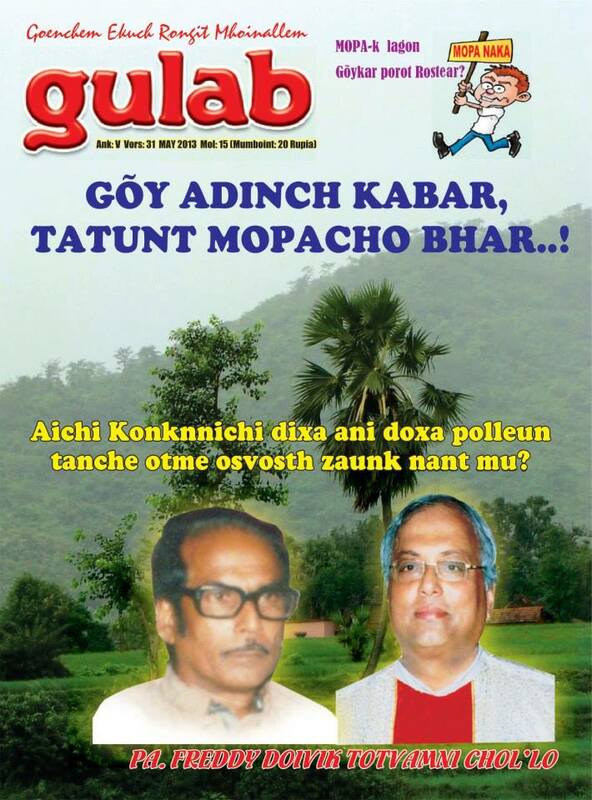 The November issue of the popular Konkani monthly Gulab is on sale. 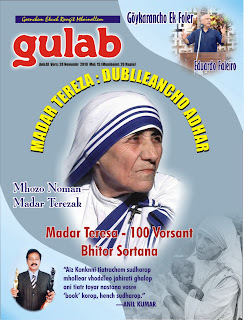 The issue dedicated to the Saint of the gutters – Mother Teresa - features the saintly life and charity work of the beatified nun. Mhozo Noman - Madar Terezak (Late Fr. Freddy J. da Costa), Madar Teresa - 100 Vorsant Bhitor Sortana (Soter Barreto) and Madar Tereza : Dublleancho Adhar (Vincy Quadros). This issue also features the interview with the veteran of the Konkani stage Anil Kumar who comments on the progress of the Konkani Tiatr , “Aiz Konknni tiatrachem sudharop mhollear vhoddleo jahirati ghalop ani tiatr toyar nastana vosre ‘book’ korop, hench sudharop; mhonnje Kolakaranchi nodor dates-incher, apleak konnache chodd show mellttolle,” Gulab aslo salutes the ex-union cabinet minister and Commissioner for NRI Affairs Eduardo Faleiro on his 70th birthday in the article ‘Gõykarancho Ek Foler - Eduardo Faleiro’ besides the regular features – Short Story, Poetry, Tiatr/CD reviews and history of Konkani literature. Goenchem Ekuch Rongit Mhoinallem Gulab hacho Novembr mhoineacho ank bhair sorlo. Kolkottachi gottoranchi Santinn Madr Tereza hankam bhettoilolea hea khas ankant Madr Terezachea xegunni jivitacher ani doyallponnachea vauracher uzvadd ghalpacho yotn kela - Mhozo Noman - Madar Terezak (Late Fr. Freddy J. da Costa), Madar Teresa - 100 Vorsant Bhitor Sortana (Soter Barreto) and Madar Tereza : Dublleancho Adhar (Vincy Quadros). “Aiz Konknni tiatrachem sudharop mhollear vhoddleo jahirati ghalop ani tiatr toyar nastana vosre ‘book’ korop, hench sudharop; mhonnje Kolakaranchi nodor dates-incher, apleak konnache chodd show mellttolle,” oxem Konknni palkacho tejixtt digdorxok Anil Kumar Gulabak dil’le khas mulakhotint mhonntta. Hea ankar Goycho adlo khasdar ani Rajya montri Eduardo Faleiro hanchea 70vea vorsa nimitan tannem Goykaram khatir kel’lea vauracher ek dhanvti nodor – ‘Gõykarancho Ek Foler - Eduardo Faleiro’. Hache xivay mottvi kanni, kovita, vicharvont lekh, tiatr-siddincho vimorso, Konknni Sahityeacho itihas adi borpam hea ankant aspavtat. The October issue of the popular Konkani monthly Gulab is on sale. 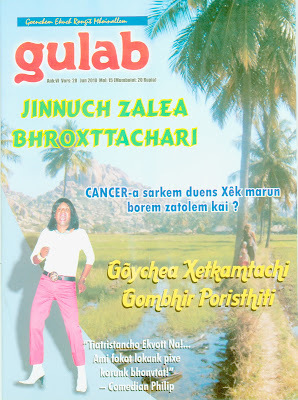 The issue dedicated to the Konkani Pasha the late Ravindra bab Kelekar features the Konkani personality and his work in the field of Konkani literature through the cover story features contributed by the Konkani stalwarts Dilip Borkar (Koddu Okhdacho Ghontt), Vincy Quadros (Ravindra: Vicharxoktichem Bhanddar), Soter R Barreto (Ravindrabab – Mhaka Disla Toso) and John M Alfonso (Ravindrabab Omor Urum! ), besides the editorial ‘Ek Sandi Jinn, Mhan Vichear’. 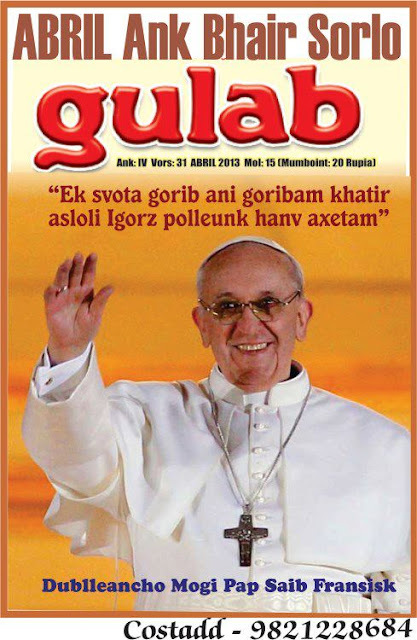 This issue also features interviews of Fr. Conceicao D’Silva, parish priest of Carambolim “Sonvsarachea konnxea-konnxeamni padri ekdom’ boro vaur kortat dekhun tancher fator poddttat.” and the pearl of the Konkani stage Annie Quadros ‘Eka kolakaran aplea patracho kholayen obheas korunk zai.” besides the regular features –Short Story, Poetry, Tiatr/CD reviews and history of Konkani literature. Goenchem Ekuch Rongit Mhoinallem Gulab hacho Otubr mhoineacho ank bhair sorlo. Konknni Pasha sorgest Ravindra bab Kelekar hankam bhettoil’lea hea ankant hê mhan veoktichi ani tannim Gõy ani Konknni Sahityik mollar kel’lea uchara bhailea vaurachi mahiti lovkik borovpi Dilip Borkar (Koddu Okhdacho Ghontt), Vincy Quadros (Ravindra: Vicharxoktichem Bhanddar), Soter R Barreto (Ravindrabab – Mhaka Disla Toso) ani John M Alfonso (Ravindrabab Omor Urum! ), te xivay ogrlekh ‘Ek Sandi Jinn, Mhan Vichear’ hea borpamni bariksannin dil’li melltta. 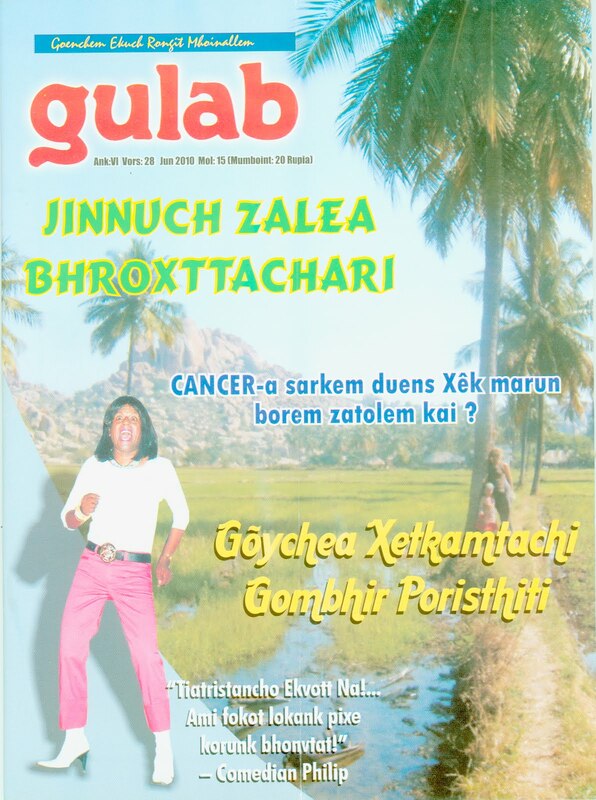 2010 annual issue of ‘Goencho Avaz’ the literary Konkani magazine of late Fr. Freddy J. da Costa hits the stands. The issue contains thoughtprovoking features and short stories by renowned Konkani litterateurs – Dr. Jayanti Naik, Ravindra Kelekar, Uday Bhembre, Felix P. da Cruz, Sudha S. Amonkar, John Aguiar, Guadalupe Dias, Yusuf Sheikh, Vincy Quadros, Marcos Gonsalves, Willy Goes et al. Published and edited by Fausto V. da Costa on behalf of Fr. Freddy J. da Costa Memorial Trust, the issue is co-edited by Soter R. Barreto whose editorial ‘Gõy-cho Avaz Kanar Poddttolo Kai Gõykaranchea?’ makes a strong case for Konkani, while the last word of the editor ‘GOENCHO AVAZ ani Romi Konknni Disallem’ unfolds the history of Konkani publications and the attitude of ‘self-styled’, misguiding so-called Konkani leaders. GOENCHO AVAZ hea sorgest Fr. Freddy J. da Costa hanchea sahityik pormollit jheleacho 2010 vorsuki ank bhair sorlo. Hea ankant lovkik Konknni sahityikanche - Dr. Jayanti Naik, Ravindr Kelekar, Uday Bhembre, Felix P. da Cruz, Sudha S. Amonkar, John Aguiar, Guadalupe Dias, Yusuf Sheikh, Vincy Quadros, Marcos Gonsalves, Willy Goes - chintunk lavpi lekh ani unchlea dorjeacheo mottveo kannio asat. Fr. Freddy J. da Costa Memorial Trust hanche torfen Fausto V. da Costa hannem sompadun uzvaddak haddlolea hea ankacho Soter R. Barreto up-sompadok zaun asa; zacho ‘Gõy-cho Avaz Kanant Poddttolo Kai Gõykaranchea?’ ogrlekh Konknni bhaxe khatir ek okhondd bazu manddtta, zalear ‘GOENCHO AVAZ ani Romi Konknni Disallem’ hem sompadok-uzvaddavpeachem nimannem utor Konknni porgottnneancho itihas vachpeam somor dovortana ‘self-styled’ ani aplea adava khatir lokam modem vankdde somzut nirmann korpi Konknniche fuddari mhonnloleanchi vrut’ti uktadar haddtta. Pondra rupya molacho ho ank Gõy, Mumboi ani Golfant potram manddancher vikrek asa. Zori konnak hea ankachi mogachi bhett koxi ek proti (fokot Bharotant khoinsorui) topalantlean apnnak patthoyloli zai zalear fausto@vsnl.net hea e-mail-ar sompork sadum-ieta. The April issue of Goa's most popular Konkani monthly GULAB hits the news stand. 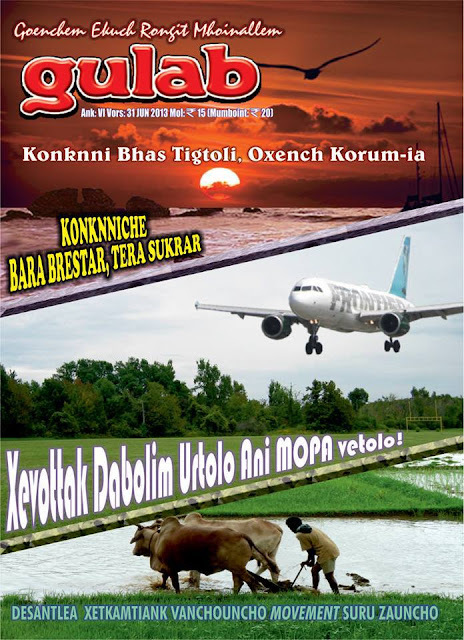 This issue carries a special feature on Konkani Associations, Language and promotion of Konkani. Vincy Quadros in his article 'Konkani Sonstha, Sahit'ya Ani Konknnicho Prochar' gives a detailed account of the promotion of Konkani language through its associations. Marcos Gonsalves highlights the many hurdles put forth by its so called leaders themselves in the promotion of Konkani language in his article 'Hi Dixa Naxil'li Konknni Chollvoll Kai? ', while Soter Barreto wonders whether the many sammelans of Konkani held are successful in bringing together the Konkani speaking people or drifting them away in his article 'Konknni Bhaxechim Sommelonam Konknni Mon'xank Ektthaim Haddttat Kai? Vo." This issue also carries Dilip Borkar's cover story on woman reservation Bill - 'Bailam Hatim Rajki Sot'ta Dadleank Porvoddtta? ', besides thought provoking articles by the stalwarts Cursino R. Pinho, Sudha Amonkar, Felix P. da Cruz, Guadalupe Dias, Willy Goes, John Aguiar, etc. Priced at Rs. 15/- this issue is available in Goa and Mumbai. For more details kindly contact 9821228684. A big e-welcome to you. Tumcam Maie-mogacho ieukar. Enjoy Life - This is not a rehearsal! Konkani uloi, boroi, vach ani samball - sodankal. Hich Goenchi osmitai ani amchem khalxelponn. Goenchi amchi Konkani bhas! Ekvottachem saddon Goenkaranchem. This is Gaspar Almeida from Parra, Bardez, Goa, based in Kuwait and am connected with the www.goa-world.com website created by Ulysses Menezes, and as Moderator of the famous first of its kind Gulf-Goans e-Newsletter (since 1994) and The Goan Forum and several Goan and Indian associations and forums and e-forums in Goa, India, Kuwait, The Middle East and worldwide.